It's been 12 years since Half-Life 2 was released, and nine years since we had any official Half-Life product from Valve; Half-Life 2: Episode Three has become the very definition of vaporware. It was announced officially, expected to follow close on the heels of Episode Two, and then vanished. Even add-ons that don't pretend to be part of Half-Life's story, such as the terrifying Episode 2 mod Nightmare House 2, feel like they could in some way be related to Gordon Freeman's adventures if you use your imagination, such is the familiarity of Valve's Source engine. By taking a step back from Half-Life 2 and giving indie developers the keys to the engine, Valve effectively granted a license for others to continue its story and keep the franchise alive without having to lift a finger. Half-Life 2's endurance is, as a result, nothing short of freakish. With mods like Sven Co-op hitting Steam, even the original Half-Life is still getting in on the game. It all begs the question: has Valve's strategy worked too well? Half-Life 3 is a sequel that everybody seems to want so desperately, and when indie developers are doing such a good job with cranking out decent Half-Life 2 mods and add-ons, I wonder whether we should let the ship sail. Half-Life 3 has become a meme, and that's never good for a game's street cred. We've seen what can happen when a "lost" game suddenly reappears after years in development hell; Duke Nukem Forever was a terrible game, which didn't even come close to living up to the legacy of the games that had preceded it. Duke's sequel showed that vastly improved graphics alone isn't enough to justify a lengthy wait if the gameplay isn't up to scratch; the less said about its story, the better. Half-Life 2's stairwell has been re-created in Unreal Engine 4, and while it undoubtedly looks gorgeous, Half-Life 3 would need the other elements – playability, a great story, a heart – in order to succeed. Perhaps it's no longer worth the effort. The closest we've come to a bona-fide new Half-Life are the Portal games. While sharing DNA with Valve's most famous franchise, those are puzzlers more than proper first-person shooters. Unfortunately – or fortunately, depending on your point of view – they demonstrated that the company still had its magic, that it could still integrate world-building with compelling action. It simply fuelled the excitement. Yet, there has been no official mention of a new Half-Life for years now, and we seem further away than ever to getting a new Half-Life game. Indeed, the series original writer, Marc Laidlaw, has just left Valve after two decades with the company. He exited stating that, "I have been feeling a need for a break from the collaborative chaos of game production, and a return to more self-directed writing projects." That statement raises even more questions than it answers; what game production was Laidlaw, a writer, involved with exactly? It seems unlikely it'd be a new Left 4 Dead or Team Fortress – those are primarily multiplayer titles. 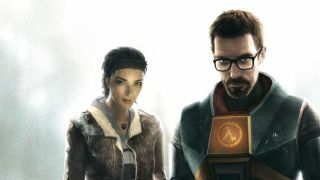 Indeed, there have been just enough leaks from within Valve that it seems certain that some sort of new Half-Life has been worked on over the past decade. There were rumours that it would feature a hearing-impaired character, that the series would return to its horror roots, that voice work has been completed… Yet no official announcement has ever been forthcoming. And all that Valve's silence on the matter has done is to fuel frustrations among the series' fans, and stoke speculation. Even a campaign to mail crowbars to Valve's offices did nothing to provoke a response. And I honestly wonder whether the longer the silence continues, the more fans stoke themselves up with Half-Life 3's potential – building a picture in their heads of the perfect Half-Life – the less chance there is of us ever seeing it. For the longer it continues, the greater the weight of expectation. Half-Life 3 isn't just the game version of Smile – the eleventh Beach Boys album that never came to be – in the minds of its fans, it has become Sergeant Pepper, Nevermind, Dark Side of the Moon, Straight Outta Compton. But it can never have that sort of impact, because Half-Life 2 already got there first. Fan-made stopgaps, however good they might be, will never be judged by the same criteria as a Half-Life 3. Fans want – nay, expect – a gamechanger. How can Valve ever live up to that? Clearly, it's a company that isn't content with putting out a that'll-do sequel or remake. It knows exactly what it has to live up to, what it is that its fans are anticipating, and we should be thankful that it hasn't rushed something purely to please the crowd. We already have the perfect Half-Life games. Maybe that's enough.